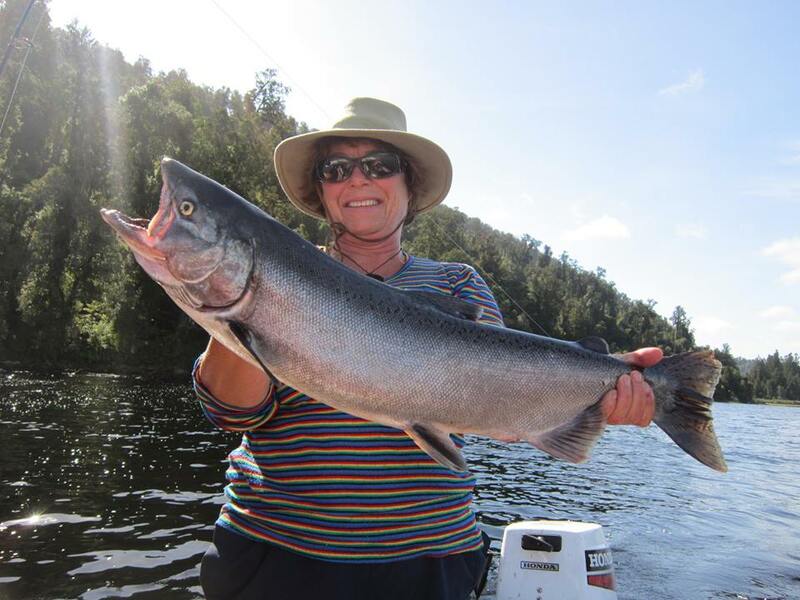 Marg Delore caught this big salmon in Lake Mapourika. 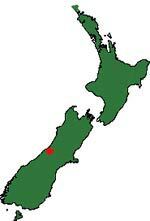 Located 10 km north of Franz Joseph in one of the most beautiful scenic parts of New Zealand. The salmon fishing is variable but there are plenty of big brown trout although you might find them hard to catch. Though there is good brown trout fishing and sea-run salmon from December to March, the thick bush cover makes access for anglers on foot around the lake difficult. The lake is too dangerous for wading. A small boat or kayak is a worthwhile investment. There are a few clear places where the thread-line angler can cast if you keep a lookout while travelling along State Highway 6. Successful spinners include anything black and gold such as a Toby, small zed spinner, or Tassie Devil. Most trout and salmon are caught near the bottom so your best bet is a slow retrieve. Marg Delore caught this big salmon in Lake Mapourika. That sure is a beaut fish! Photo courtesy of Marg Delore. Lake Mapourika, at 11 square kilometres (7 square miles), is the second largest lake in West Coast region after Lake Brunner. The lake bed is 37 metres (120 feet) at its deepest. The lake is carved from an ancient glacier. Perhaps surprisingly Mapourika is not a Maori name. Rather it was the name of a ship that sailed between New Zealand’s West Coast and Australia during the gold rush of the 1800s. In those days it was faster to sail from the West Coast to Australia and back to a New Zealand port than to travel overland by a more direct route. Fish & Game sign at Lake Mapourika. The small red insert says, “Attention Anglers: If you have captured and kept your bag limit for one species you must cease fishing for the day. Salmon were first released into Lake Mapourika as early as 1932. 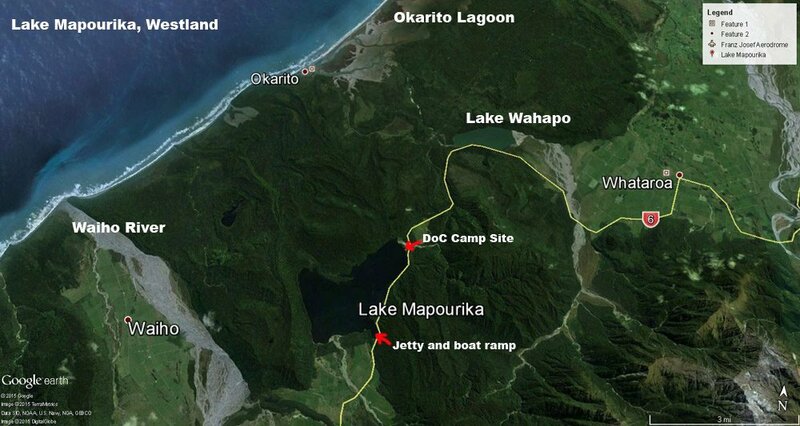 Quinnat salmon run up the Okarito River from the sea into the lake from December to April. Some years the salmon fishing here is very good indeed. Big salmon are also taken by deep trolling. There is also a small population of smaller landlocked salmon present in the lake. Just under 6000 Quinnat salmon fingerlings were released into Lake Mapourika back in 2015. Expert angler Lex Coutts from Christchurch with a 1.8 kg butter-coloured Lake Mapourika brownie taken trolling. Like all the West Coast lakes that have dense bush surrounding them the water is tea coloured from rainwater leaching through the vegetation. This makes spotting trout hard work. Spinning and trolling are the preferred fishing methods. The Okarito River drains Lake Mapourika into the Okarito Lagoon. The open season for trout and perch fishing in Lake Mapourika (excluding tributaries) is all year. McDonalds Creek at Lake Mapourika is closed to fishing at all times. The minimum length for trout and salmon caught in Lake Mapourika is 250mm. The bag limit in Lake Mapourika is 2 trout and 2 salmon. Bait, fly and spin fishing are all permitted on this lake, as is the case with all waters on the West Coast. The Open Season for salmon in Lake Mapourika is 1 October to 31 March. 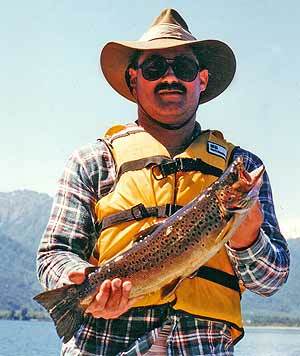 Brown trout fishing is permitted all year. You can download the West Coast Fish & Game Region Access Brochure. The Department of Conservation Otto/MacDonalds Camp Site is located at the northern end of Lake Mapourika. It has basic facilities only. Glacier Country Lake Tours vessel at the southern end of Lake Mapourika. Glacier Country Lake Tours offer scenic lake trips and fishing charters. Tour boat the Hanna-K at the southern end of Lake Mapourika. Lake Mapourika, Westland. Photo: GoogleEarth, TerraMetrics, Landsat, DigitalGlobe. From a height of 3 miles. There is a small lake in the bush to the north-west of Lake Mapourika called Alpine Lake Ata-Puai. Click on the map to enlarge. Though this event took place some time ago many will find it interesting. This fishing competition is still run each year. Over 130 anglers from all over New Zealand entered the South Westland Lions Club fishing competition held in 1995 at Lake Mapourika. The organiser of this year’s event, Stan Peterson, said anglers had travelled from Napier, Christchurch, Dunedin, Rakaia, Nelson and all over the West Coast to enter the competition. The weather was a real mixed bag with everything from sunshine to rain, thunder and lightning. Those who braved the poor conditions on Sunday were well rewarded as this was the time when the winning salmon were caught. Mr Paterson said that the competition was now in its sixth year and was becoming better known all the time. It was also good to see some old hands at the event, some of whom had attended all six competitions. A change was made to this year’s competition with the associated social events being held on the lake shore itself rather than at the Franz Josef village. The picnic area at McDonalds Creek at the northern end of the lake proved the perfect venue. First prize for the heaviest salmon was won by Alistair Climo of Hokitika with a weight of 7.265kg (15.9lb). Alister’s prize was a Yamaha four horsepower outboard motor, sponsored by South Westland Lions Club and McLaren Motors. In second place was Merv Valenski from Jackson Bay. Merv’s salmon weighed 7.060kg (15.5lb) and won Merv a Yamaha two horsepower outboard motor, also sponsored by South Westland Lions Club and McLaren Motors. Third prize of a $300 Mobil voucher was won by N.Fegan for his 6.430kg (14.1lb) salmon, sponsored by Mobil Oil New Zealand Ltd. A salmon weighing 5.960kg (13.1lb) won the fourth prize of an accommodation voucher for two with Scenic Circle hotels South Island wide for James Tisdall. Fifth prize, a microwave oven, was won by Robert Kirkwood for his salmon weighing 5.725kg (12.5lb), sponsored by South Westland Lions Club and Westpower, Hokitika. The Milan Arnold trophy for the heaviest salmon overall in the junior section of the competition was won by Quentin Arnold. Quentin’s ﬁsh weighed 4.300kg (9.461b). Quentin’s prize was a trout rod and reel plus an A.S.B. bag, sponsored by Hokitika Cycles and Sports, South Westland Lions Club and A.S.B. Bank – Hokitika. All ﬁshing competitions have their hard luck stories. The two “winners” in this category received a “talk about tears” T-shirt. They were Tommy Nolan, who lost his very expensive rod and reel over the side of his boat and Kevin Penrose who managed to hook himself in the head while casting. South Westland Lions spokesman Allan Cooper welcomed the donation of a new prize for this year’s competition, the Te Koeti Runanga Pounamu Trophy, for the heaviest salmon caught on the ﬁrst day of competition and won by James Tisdall. Mr Copper said that the donation of this trophy reflected the excellent support given to the competition. Mr Cooper also said that the Lions Club had been able to take a back seat with the organising of this year’s Lake Mapourika fishing competition thanks to the excellent job done by local anglers in putting the project together. Mr Cooper noted that it would be interesting to analyse the effect of the competition on the local economy and expected that it would be considerable given the large number of visitors regularly attracted to the event. Many who travelled to Lake Mapourika for the fishing competition were so impressed they later returned for family holidays on the Coast. Other prize winners included: Winner of second place in the Junior Salmon Section was Nathan Blackburn with a fish weighing .335kg. Nathan’s prize was an A.S.B. Bag plus a $25 Voucher, sponsored by A.S.B. Bank – Hokitika and The Tackle Box, Christchurch. Third prize with a trout weighing .520kg went to D. Blackburn. The prize was a Flask and Pliers plus a $25 Voucher, sponsored by Renton Hardware Ltd, Hokitika and The Tackle Box, Christchurch. Junior Anglers Fish 1st prize of a Knife, Fork & Spoon set plus a Tackle Box, sponsored by the South Westland Lions Club went to Gerard Williams with a fish weighing 3.080kg. 2nd prize of a Knife, Fork & Spoon set plus a Tackle Box, sponsored by the South Westland Lions Club went to Nathan Blackburn with a ﬁsh weighing 1.670kg. 3rd prize of a Knife, Fork & Spoon set plus a Tackle Box, sponsored by the South Westland Lions Club went to Andy Lash with a ﬁsh weighing 1.670kg. Heaviest Trout Overall 1st, Phil Crosland, 2.855kg. 2nd, Paul Thompson, 2.420kg. 3rd, Don Fox, 2.190. Teams Event was won by Ken, Quentin, Sandra and Milan Arnold with a total weight of 12.075kg.